APTRANSCO AE/Assistant Engineers recruitment 2018:: APTRANSCO AE/Assistant Engineers recruitment Results 2017, Certificates verification/ APTRANSCO AE/Assistant Engineers recruitment 2017 | Apply online, Online application form, last date for apply, hall tickets, results, selection list and more details are available @ http://www.aptransco.gov.in/transco/, APTRANSCO is going to release the 198 #AE/ Assistant Engineer Posts 2017 Recruitment Notification in January 2017 and Transmission Corporation of Andhra Pradesh Limited (APTRANSCO) invites #onlineapplications from the eligible and qualified candidates for the post of Assistant Engineer (Electrical and Civil). The erstwhile Andhra Pradesh State Electricity Board which came into existence in 1959 was responsible for Generation, Transmission, and Distribution of Electricity.Under Electricity Sector Reforms agenda, Government of Andhra Pradesh promulgated Andhra Pradesh Electricity Reforms Act,1998.The erstwhile APSEB was unbundled into one Generating Company (APGENCO), One Transmission Company(APTRANSCO) and Four Distribution Companies (APDISCOMs) as part of the reform process. ENERGY, I&I DEPARTMENT – Creation of 382 additional posts in various categories in A.P. TRANSCO– Orders – Issued. 2. Energy, I&I Department, U.O. No. 535/OP.A3/2017, dt:03.01.2018. In the reference 1st cited, the Chairman & Managing Director, Andhra Pradesh Transmission Corporation has stated that the Government of Andhra Pradesh in the year 2009 has accorded approval for creation of posts for the Substations Commissioned till 2008. The A.P. TRANSCO having commissioned many new substations and lines. As a result, today A.P. TRANSCO has assets of thousands of crores left without manning and man power support. Therefore the A.P. 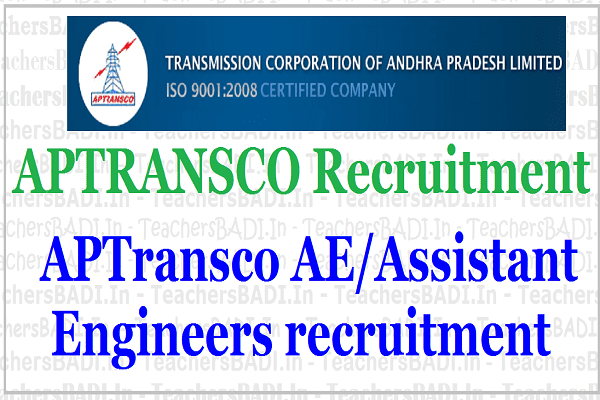 TRANSCO has requested for creation of 382 additional posts in A.P. TRANSCO to meet the present acute exigency. 2. In the reference 2nd cited, the Energy, I&I Department has requested for creation of 382 additional posts in various categories in A.P. TRANSCO. 1. After careful examination of the proposal, Government hereby accord sanction for creation of the following 382 temporary additional posts in various categories in A.P. TRANSCO. 4. The expenditure on account of creation of additional posts shall be born by AP TRANSCO. 5. The Energy, I&I Department shall take further necessary action in the matter. Age Limit: Minimum 18 years and Maximum 42 years. The age is reckoned as on 01/03/2017. As per G.O.O(CGM-HRD-Per) Ms.No.166, dt.02.09.2015, the Upper age limit is raised up to 10 years i.e., from 34 to 42 years. 4. Downloading of Hall tickets is 20-04-2017. The written examination for recruitment of Assistant Engineer (Elecl., & Civil) will be held on 30.04.2017 at 10 AM to 12 Noon. 2) No. T.A. and D.A. will be paid for attending for verification of Original Certificates. 3) Calling for verification of Original Certificates does not confer any right to claim appointment as Assistant Engineer (Elecl., & Civil). 4) No representation/queries will be entertained from unsuccessful candidates. 5) The provisionally selected candidates are requested to attend for verification of Original Certificates with the following certificates. a) Age: Proof of age as recorded in SSC certificate or equivalent. b) Qualification of BE/B. Tech/AMIE or equivalent from any recognized University in India. C) Permanent Community certificate issued by MRO in original or Original caste certificate issued by Revenue Officer not less than the rank of MRO issued latest by 6 months in respect of SC/ST & BC candidates clearly indicating the Sub-Caste and group. d) Physically Handicapped certificate indicating the percentage(%) of disability issued by the concerned competent medical board. e) Study Certificate from Class-IV to X. If private candidate Residential Certificate issued by the Officer of the Revenue Department not below the rank of Tahsildar in independent charge of Mandal as the case may be. No.4136/SPF&MC/2015-9, dt:03.09.2016) issued by Tahsildar, if migrated to Andhra Pradesh. g) Hall-Ticket issued for written examination. h) One set of attested copies of all the above certificates. If the documents produced are as per details mentioned in the online application you will be required to deposit the Original documents at the time of verification.